Para Juanjo, por todo lo que nos dejamos en el tintero. Little have I said after almost 200 chronicles about one of the most popular Japanese pens—the Pilot Myu 701. On a personal note I can say that the Pilot Myu was responsible for my renewed interest on fountain pens. I was already in Japan and an Internet search produced one of the very few websites with information in English on Japanese pens and, more in particular, this pen. Its online price, though, looked totally unreasonable, but being in Japan I thought I could find it for much less. For once, I was right. That was in 2004. Since then, a number of things have changed and there is a lot more information on Japanese pens. The invisible hand of the market, on its side, did its share to reduce the price of a very common pen. The Pilot Myu was launched in 1971 and was clearly inspired on the short lived Parker T1 for its basic feature: the integrated nib. 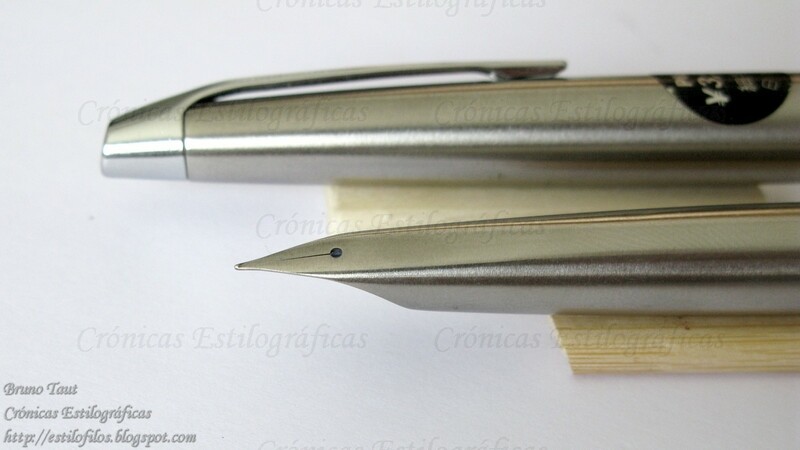 On the other hand, this is a pocket pen, a concept created in 1964 and adopted by Pilot in 1968. It was on production until 1980. There existed three basic variations—the most common in plain steel shown on this chronicle; another in black stripes; and the very rare with non-colored stripes. Interestingly enough, this pen deserves just one short sentence, and no picture, on Lambrou’s book Fountain Pens of the World despite being well known outside Japan and having become an icon. Arguably, this pen might be responsible for the popularity of affordable Japanese pens outside Japan. It certainly proves that Japanese pens are a lot more than just those decorated with maki-e and urushi techniques. I will start by admitting that I am positively biased towards this pen. I find its clean lines very attractive and being a pocket pen only adds value to it. However, I reckon that some users (strongly) dislike metallic gripping sections. This pen is clearly not for them. Regarding the design, I am prompt to admit this pen has several weak points. 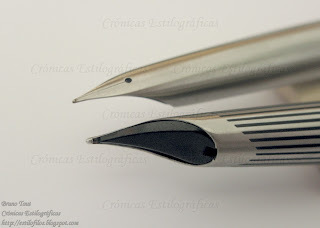 The main one is directly associated to its streamlined look—the integration of nib and section makes the pen very vulnerable to defects and to accidents affecting the nib as there is no actual replacement for the nib. This is the inherent price to pay for pens like this. Not so inherent are other elements. The beautifully looking clip is not spring-loaded and cannot be used with thick fabrics. Some would say that this was a pocket pen and, therefore, this pen was intended to be carried in shirt pocket, and this purpose is perfectly suited with this clip. On this picture, both threads of the central ring are loose. Only one, that on the right, should open when inking the pen with anew cartridge or to access the converter. A third weak point is the central ring. 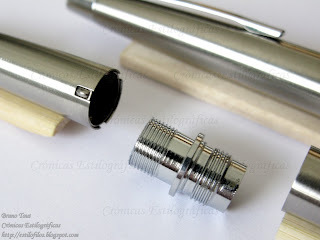 Section and barrel are hold together by this two-threaded ring. When opening the pen, only the barrel thread should come off. However, at times it is that in the section that comes off, and that exposes the spring loaded clutch —a very subtle detail— that secures the cap when closed. These defects, though, do not affect the performance of the pen. The central ring, completely disassembled from the section (top left) and from the barrel (bottom right). The clutch to secure the cap can be seen on the section. This pen is certainly well made. It is solid and has stood rough treatment in pockets and backpacks over the years. The fit between barrel and cap, essential for the writing comfort of a pocket pen, is still perfect. On the negative side, I will note that the barrel has become slightly scratched by the cap by the repeated process of posting the pen. This pen is a bit on the heavy side, but its very correct balance (55% to the tip-45% to the top, posted) makes it for its ease of use. And indeed this pen is a very good writer. Center of gravity: at 78 mm from the tip, posted. 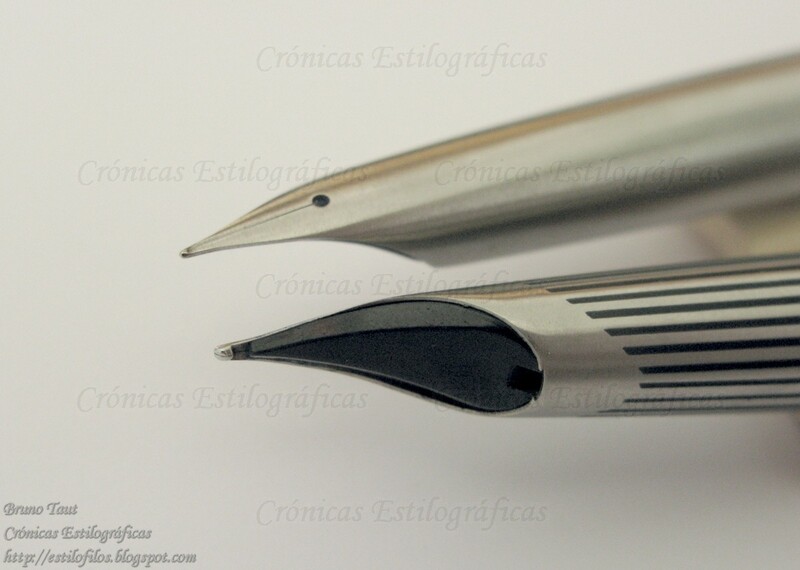 This pen is equipped with a very rigid nib made of steel. Its F point is very smooth despite being on the dry side. However, the ink flow is perfectly constant and never skips a bit. This Pilot is, in my opinion, a basic functional pen and this nib is accordingly reliable even if uneventful beyond its looks. These pens had three nib point options: F, FM, and M. The second of them, though, is very rare. Nib and feed of two Pilot Myu with points F (back) and M (front). This is a Pilot-proprietary cartridge-converter pen, and of all the different converters of the company, only the bladder-type CON-20 actually fits in this pen. Cleaning wise, this is not a difficult pen, as is the case with most cartridge-converters. On this pen, though, removing the feed is not straight-forward and the basic cleaning option is simply flushing some water through the section. Minor corrections of ink flow are harder and riskier to carry out on this pen than in more standard pens, i. e. with non-integrated nibs. But this is hardly a real need given good quality control of these pens. This pen cost JPY 3500 when it was marketed in the 1970s. The contemporary Capless (1971), on its side, was JPY 4000, and the fancier black stripped Myu (model M-500BS), JPY 5000. These relative costs make some sense after all—the Capless is a more sophisticated pen and includes a 14 K gold nib. The Myu was a more basic tool and was price accordingly. And, therefore, there is a steep overprice for the more appealing looks of the black stripped pen. My grades reflect the current pricing in Japan, where the plain steel Myu is relatively easy to find. Writing this review was a struggle between my high appreciation for this pen and the actual knowledge of its weak points, and the final score seems to reflect the first rather than the second. Nonetheless, I hope I had described the defects I have seen in this pen over the years, which, at the same time, do not compromise its very good performance.